Ever since I can remember, I’ve always wanted to travel to Europe, indulge in real German chocolate, float down a canal in Venice and be immersed in different cultures. Studying abroad for an entire semester seemed a little too intimidating to me, so I decided to start looking into summer programs. For the College of Natural Resources students, six weeks of summer field experience is required for graduation either at Treehaven Field Station, in Stevens Point or in Europe. Being the adventurer that I am, I couldn’t pass up this amazing travel opportunity. In October, I applied to the program and waited anxiously for two weeks to hear if I got accepted. Seeing that acceptance email was definitely one of the happiest moments of my life. During spring semester, the 28 of us going to Europe would meet once a week for our hourlong class. We learned more about what we were doing in Poland and Germany, the cultures, basic German and Polish words and how to get around Europe during our extended weekend. Guest speakers from Financial Aid and the Study Abroad office also spoke during our class, about all the logistics of studying abroad. This class gave me a better understanding of what to expect in Europe. Before going abroad, I also had to take classes at the Central Wisconsin Environmental Station (CWES), or what I like to call math camp, which was essentially Treehaven crammed into two weeks. While most courses at Treehaven take one week to complete, courses at CWES only span two days. Typically, our first day would consist of lectures, some application of what we were learning and then time to complete our assignment. The following day we’d spend all morning in the field out on our 40 acres, then return to complete our assignment. After classes, we had the ability to use the CWES’s canoes, kayaks and paddleboards on Sunset Lake. We had about three weeks between CWES and Europe, which I used to acquire spending money. On July 6, we all met at O’Hare International Airport in Chicago, IL and were off to Poland. The flight was about nine hours and we arrived in Poland around noon—5 a.m. in U.S. time. After collecting our bags, we hopped on a bus and rode three hours into the mountains to Czorsztyn, where we were staying for the week. We stayed in a beautiful historic hotel located on a lake surrounded by mountains. It was a landscape pulled out of a tourist guide—absolutely stunning. During our time in Czorsztyn, we had lectures on insects, bats, measuring biodiversity, forestry, Polish national parks and many other topics. We also went on field trips almost every day. Some of the places we visited included Tatra National Park, Gorce National Park and historic medieval castles. At our hotel, we got to indulge in all sorts of traditional Polish food, my favorite being Polish apple pancakes. Some nights we were treated to a band, which was a fun way to end the day. For our second week in Poland, we stayed in Krakow, a city full of art, history and life. While in Krakow, we took field trips to the Wieliczka salt mine, Babia Gora National Park, the Krakow art museum, and plenty of other places. When we were done with classes, we had the rest of the evening to explore the city. I loved exploring the cobblestone streets of Krakow. There was always something going on, with live music on almost every corner and a number of unique shops and street vendors to check out. It was definitely hard saying goodbye to the beautiful city of Krakow, as well as the country of Poland, but Germany was calling us. We spent 2 ½ weeks in Germany in the middle of the Black Forest. We stayed at an environmental education center that overlooked a luscious valley. Every morning we got up as the sun was rising to eat breakfast and hopped on the bus to travel one to three hours to a site where we’d get a lecture. My favorite day was when we visited a snail farm, water buffalo farm, and a horse breeding facility! 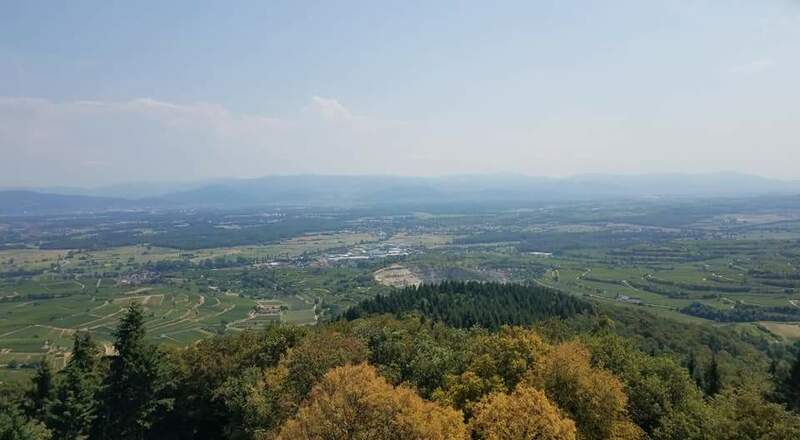 We also visited a water purification facility, Black Forest National Park, a vineyard (which included wine tasting), an urban park, and even spent a few hours in Switzerland. Germany was so beautiful and fun! I loved the food, scenery and learning about all the places we visited. During our stay in Germany, we had a three-day weekend where we could travel anywhere we wanted. A small group of us decided to travel to Amsterdam, Netherlands. Our train left a bit after 12 a.m. on Saturday and after a number of transfers, we arrived in Amsterdam around 10 a.m. Tired from the travel, we didn’t do much the first day besides walking around the city and grabbing a bite to eat. The next day was more sightseeing and exploring the city. We visited the Van Gough museum and checked out a craft market. Sunday morning, we hopped on our train back to Germany and after a delayed train, we finally got back to our German home around 11 p.m. Even though our time in Amsterdam was short, I’m happy I went and definitely want to go back! I am so grateful that I had the opportunity to go to Europe this past summer for my field experience. I gained so much knowledge and appreciation for the different cultures we were in, each country’s strategies for natural resource management, and the beautiful landscapes of Poland and Germany. As I sit in class this semester, I often reminisce about standing atop a mountain and overlooking the beautiful Polish countryside as one of my professors lectured about mountain meadow biodiversity. As I look out my window to Schmeeckle Reserve, I think back to looking out my window in Germany to the stunning, blue-green valley that laid below me, and how much I miss that view. I have a strong desire to go back to Europe after this past summer to explore more of the history, culture and landscapes. This experience was such a privilege and I advise anyone thinking of studying abroad to DO IT! You won’t regret it. The experiences you have in Europe are priceless and you won’t get them anywhere else. You must be logged in to comment, log in with your social media account.